Great Ceramic Sharpening Rod !!! Very nice ceramic "steel". Works great on German high-carbon steel knives and Japanese VG 10 blades which are harder to sharpen. There is a neat little hard plastic "bumper" on the end of the rod that protects the rod and any surface that you might put the tip on to sharpen your knife. It seems to be the right grit for fine tuning a knife. This rod and a standard "steel" would be all a home chef would need. I love it ! Very nice and works great. Seems to sharpen faster and better than our other sharpeners. The only complaint that I have is that my husband has my knives so sharp I'm concerned I may lose a finger. LOL I'll have to learn better knife safety now. Evenly sharp from base to tip of knife. 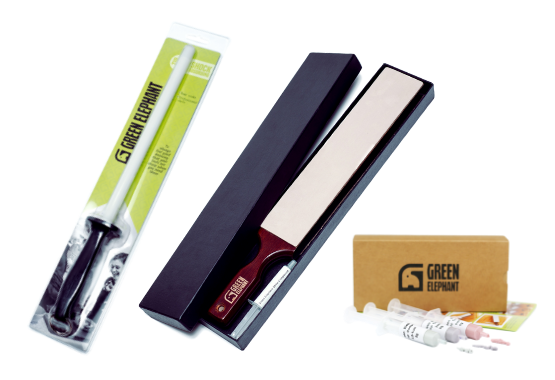 I used the Green Elephant sharpening rod as soon as I received it in the mail. I had never used a sharpener like this before. The instructional video on the Amazon listing was a big help. I was reluctant to pay the price. As it turns out, I am quite pleased with how it evenly sharpened my knives from base to tip. I'll never use those creepy sharpeners on the back of electric can openers again.